Becoming the wielder of the Witchblade is a big adjustment. Especially for Mary who's still recovering from the battle with an "armored winged beast." Stjepan Sejic's reimagining of the Witchblade mythology continues with some needed character development and a surprise appearance from its most famous bearer. Imagine being a teenager like Mary, an introvert with nerdy pursuits, and all of sudden you've been given this incredible power and you have to explain what happened in front of her parent's store. It's a lot to take in and believe as it defies everything you know about the world. Sejic takes his time with Mary's emotional state and dealing with these crazy circumstances. It's the right move to develop Mary through this great trauma to understand her state of mind. Mary's dad is understandbly concerned with her, but a visit from Detective Sara Pezzini concerns him more. It's nice to see Pezzini, who wielded the Witchblade in the long-running main title, now that the flagship book has ended. Mary surprisingly details the events just as they happened. Sara seems sympathetic which hopefully means an alliance going forward. Unfortunately, her brother Tim is a lot less understanding. He's frightened by what he saw his sister turn into during that battle. It creates a nice reconciliation when she reassures him that she's fine. Meanwhile, the Darkness, the Angelus and Kenneth are onto the new wielder leading to an explosive cliffhanger. It's all brought to glorious life with Sejic's incredible art style. The bright colors, angular pencils, and bold layouts really add a sense of energy as the story moves from smaller scenes to larger action pieces. And no one tells a story through facial expressions better than Sejic. With a teenage girl with newly found powers and attention, there's plenty of them. 'Switch' belongs in the conversation of other books geared toward young adults like Black Canary, Batgirl, and Ms. Marvel. 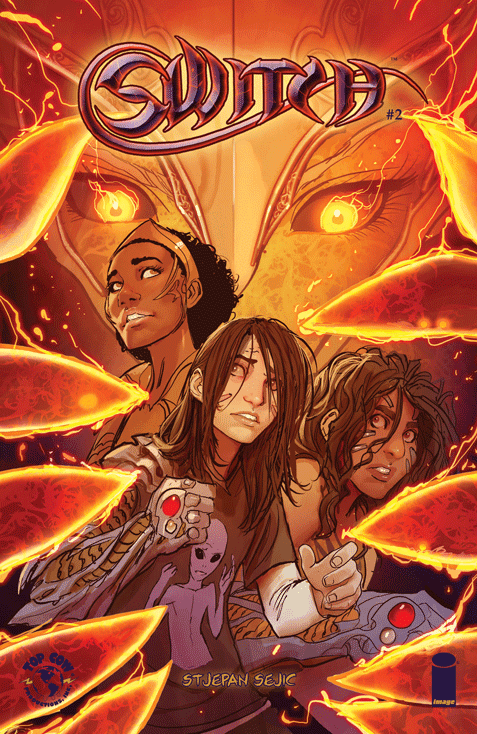 Sejic has reinvigorated the Witchblade brand with a likable new bearer and world building that is primed for action. 'Switch' is a winner.